Pumpkin Spice Blondies are a dense, fudgey brownie made with pumpkin purée, white chocolate and seasonal spices. Pumpkin purée – an American novelty? There is often a lot of debate in England about things that have become “Americanised”. Whether its Halloween, Christmas or even our language, American culture often has an impact on the UK’s and as a foodie I often look to trends in the US to see what is going to be popular for us in the next 5 or so years. If it happens over the pond, no doubt it will happen here too. Some people complain but I say lets embrace it! Pumpkin – or more precisely pumpkin purée is just one of the gifts America has given us after the last few years. Although we’ve had pumpkins in the UK for a very long time, and I’ve been carving pumpkins for Halloween as long as I can remember, cooking with pumpkin is quite a new thing. The fact that you can now buy Libby’s pumpkin purée in Asda rather than ordering it online is proof that more and more UK cooks are looking to America for inspiration in their cooking, particularly in the autumn. An apple pie just won’t do any more! I’ve tried pumpkin pie a few times myself. The first time I tried to make one I was a little too impatient and topped the pie with whipped cream and marshmallow almost immediately after it had come out of the oven. It tasted fantastic but we did end up with a sticky puddle of cream where the pie once sat. In years gone by, as well as the humble pumpkin pie I’ve also come up with recipes for Pumpkin Cookies with Cinnamon Chips and my own version of Starbucks Pumpkin Spice Latte (made with real pumpkin of course!) This year I was back in the kitchen experimenting with my latest haul of Libby’s pumpkin purée. Having had recent success with my Chestnut Brownie recipe (watch out for that in November…) I thought I’d apply the same principles to a can of pumpkin instead. 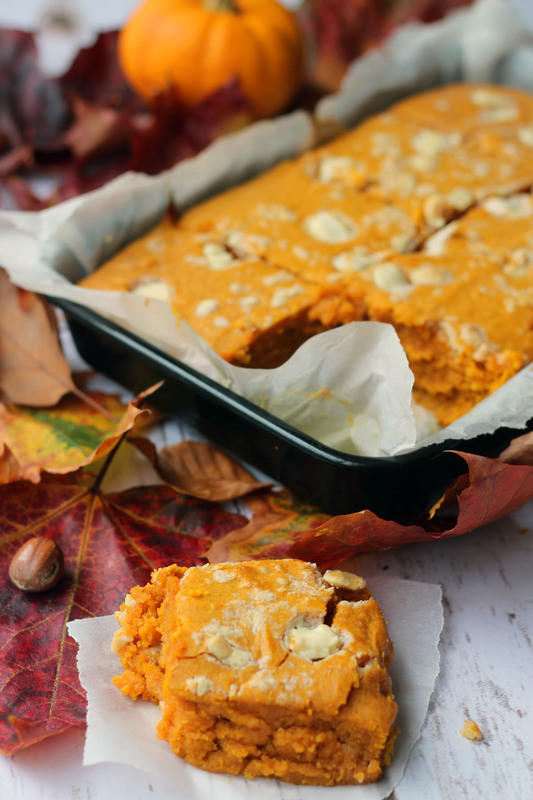 The moist pumpkin purée keeps the blondies fudgey and moist – there’s no chance of a dry cakey brownie here. The white chocolate adds a rich sweetness and the vanilla and spices help to marry the savoury pumpkin with the sweet chocolate and sugar. Whilst the recipe does call for you to measure out your own individual spices, I have actually come across something rather spectacular – the “Signature Spice” mix at Waitrose. It’s a seasonal product and not all stores will be selling it yet but it’s a fantastic pre-made mix of festive spices. It’s perfect for all your festive baking! Feel free to substitute my spice suggestions for a heaped teaspoon of the Waitrose mix if you want to make life a little bit easier. 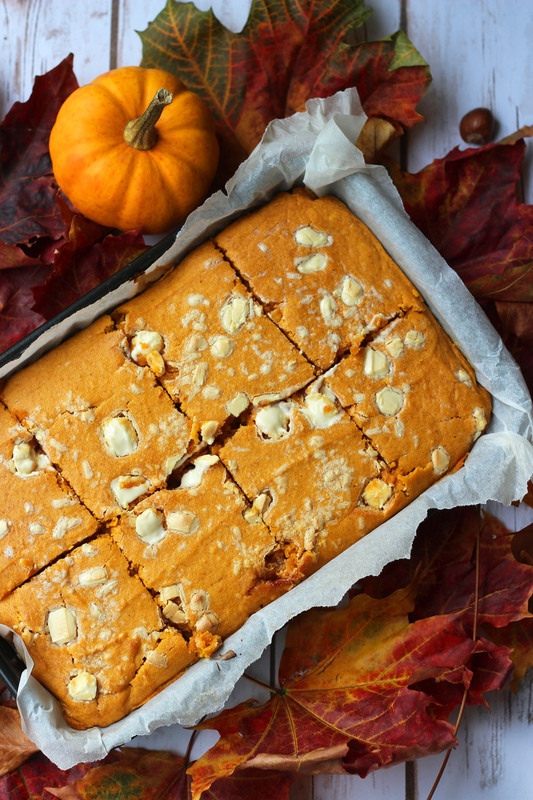 These Pumpkin Spice Blondies are the perfect way to use up a can of pumpkin puree. Pre-heat your oven to 180C and line a 9 inch rectangle baking tin with grease proof paper. Place a couple of inches of water into a sauce pan and bring to the boil. Turn off the heat and place a bowl over the hot water. Break the chocolate into cubes and add to the bowl, melt gently with the butter (also cut into cubes), stirring frequently. Once the butter and chocolate have melted together, slowly stir in the sugar. You will be left with a glossy chocolate mixture. Pour this into a large mixing bowl and beat in the pumpkin purée until smooth. Leave the pumpkin and chocolate mixture for a few moments until cool and beat in the eggs. Sift the flour, vanilla and spices into the batter mixture and fold gently until combined. Pour the blondie mix into the lined tin. Bake in the centre of the oven for 25 minutes or until the brownie mixture is set and a crisp top has formed with distinctive cracks. Allow the blondies to cool in the tin before, cut into squares then carefully remove from the tin, peeling away the grease proof paper. As with any brownie, my favourite way to serve these Pumpkin Spice Blondies is straight out of the oven with a big dollop of ice cream. You can’t beat the cold ice cream melting over the crisp outside of the blondie, then melting into the soft gooey centre. It really is heaven! If you haven’t already jumped on the pumpkin purée bandwagon then hopefully this has convinced you – whether you live in the UK, America or somewhere in between! I’d love to read your comments, just drop me a message below. And if you make these Pumpkin Spice Blondies please do send me a photo! You can tag me in as @EFWalt on Instagram or @KitchenGoddess3 on Twitter. Even better – why not post your photo to the Supper in the Suburbs Facebook Page?! Or why not try these Pumpkin Spice Cookies with Cinnamon Chips also on the blog! these sound like a perfect autumnal treat emma! Thanks Roz 🙂 there’s certainly plenty of warming cinnamon and ginger to remind you we’re now in the colder months! This is indeed very autumnal and such a wonderful recipe.I can see these going like hot cakes at any bonfire party. Today finally feels like autumn here in New York with a chill in the air and orange color in the trees. 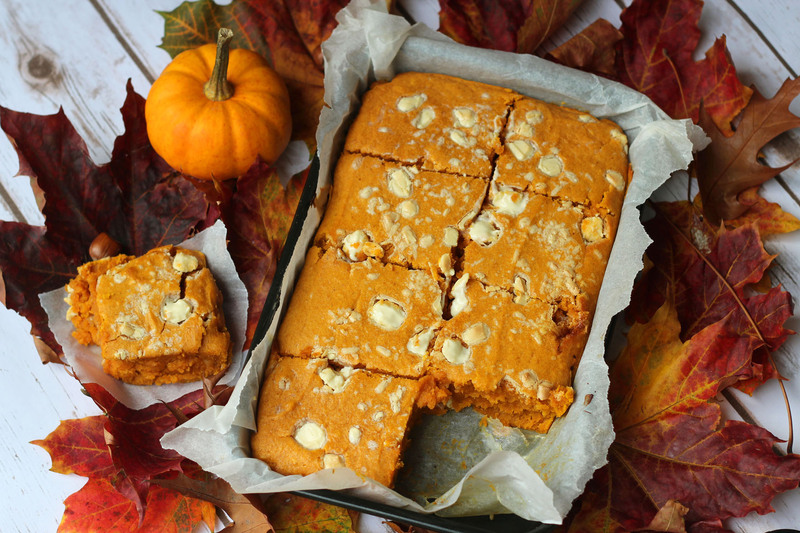 Your pumpkin Blondies would be an amazing addition to my Sunday afternoon coffee! For now, I’ll have to drink it with your picture in mind! I hope to make them soon they look easy and delicious ! Hope you had a lovely weekend! These look awesome! Love a blondie, definitley going to be trying out this recipe soon!